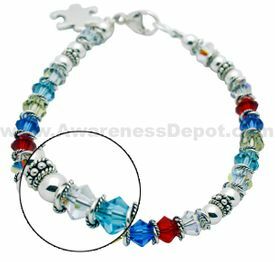 This Sterling silver and Swarovski crystal Autism Awareness bracelet style 12 features Red, Blue and Yellow Swarovski crystal beads alternating with accent Bali beads and highlighted with silver beads. This style ends in a secure sterling silver lobster clasp that's perfect for people who use their hands a lot during the day and don't want to have to worry about their bracelet. Like all our beautiful Autism bracelets, this is accented with a lovely sterling silver puzzle piece charm. Our in stock bracelet measures 7 1/2 inch (standard size). Custom bracelets sizes are available 6" to 7 3/4". Just put your desire bracelet size in the comments section. Kindly allow 7 days for custom size bracelets.